Many volume switches in early Japanese transistors radios include date stamps. Granted, these are often impossible or extremely difficult to view without dismantling a radio. 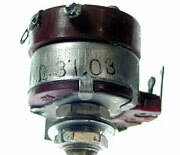 In most radios I've observed, the date on the volume switch matches the caps closely enough to speculate that most of them were used in building the radio within a couple of months after the part was made. This does make them useful for dating, particularly in radios that don't have date stamps on the caps. (a) This large switch is from a Sony TR-72 and carries a date stamp of "31.03". Using the formula "YY.MM" and keeping in mind the "nen-go" (era name) calendar described near the end of Part I, we recognize the "31" as representing the year Showa 31, or 1956, so we can discern that this switch was made in March 1956. (b) Here we have the switch from a Sony TR-65 made in July 1958. This date is relatively easy to determine using the formula "MMYYx". I suppose the final number might represent the day, but I've always contented myself with the month and year on these, so never bothered to read this far. I will be more diligent in the future and will update this entry if I observe a consistent pattern. (c) Once again we have the "YY.MM" formula using the "nen-go" dating scheme on the volume switch from a Channel Master 6501, (which is an export model made by Sanyo and similar to the Sanyo 6C-8). I include this as a handy example that shows we do continue to find the "nen-go" dating in use at the end of 1958 on export models such as the Channel Master. (d) [Not shown] Because I happened to notice it the other day, let me mention that I spotted the date on the volume switch in a Hitachi TH-667 without dismantling the radio. It too uses the "YY.MM" formula and the "nen-go" dating scheme with a stamp that reads 33.05, or May 1958. 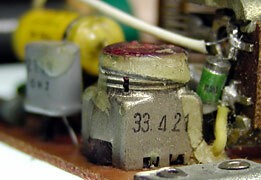 While some open air variable tuning capacitors have date stamps in easily read locations, ones such as the example below don't reveal their stamps without removing them from the circuit board. Still, many do include a date stamp on the bottom. This is a Mitsumi PVC-2B "POLYVARICON" (Polyethylene Variable Condenser) from a Hoffman R-P410 Home & Travel radio. The date code formula here is "Y.MM.DD", and we know this has to be from the 50s, so the stamp "6.12.24" translates as a manufacture date of December 24, 1956. I was going to photograph a second Mitsumi PVC-2B from my Hitachi TH-669 to use here as a different example, but carelessly re-attached the part without taking a photo. The reason I thought to include it as a second example is that, while it is from July 1957, the date stamp used the "nen-go" system and the formula "YY.M.DD". The date stamp on this sample is "32.7.12", which tells us the part was manufactured on July 12, 1957, (July 12 in the year Showa 32). Not as many transformers have dates on them, but it's worth noting that some do. Here's one sample for now. Here's an input transformer that proudly shows a date stamp on the side. Once again using the "YYMM" formula and the "nen-go" calendar, we understand that this part was manufactured in October 1957, (October in the year Showa 32).